In this review we expose the Poke Coin investment scam. 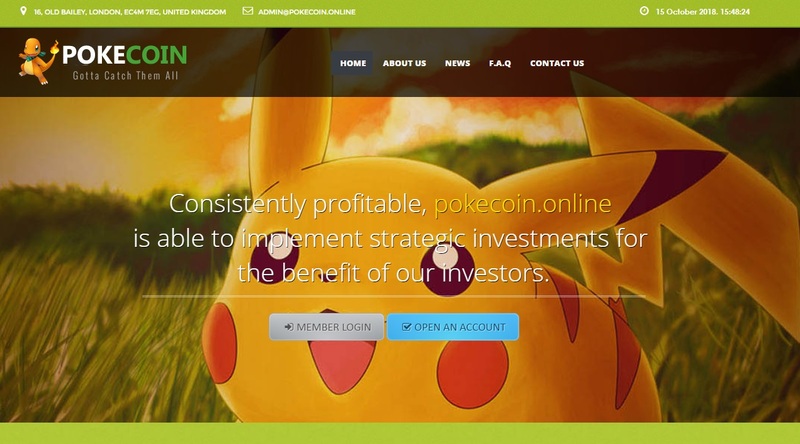 PokeCoin.online is an investment website that lets you deposit bitcoin and promises you to pay you interests. There are several investment plans, you can get up to 24% net per day. This means doubling your money approximatively every four days. Is it possible? No, it is not possible to double your money every four days, not even every month. There is no legit business in this world that could do that long term. Only Ponzi scheme display such outrageous plans, because they are scams. PokeCoin is a scam that will just take your money and you will be very lucky if you get at least a part of it back. These scam schemes just collect deposits and redistribute some of them on withdrawals, but then they quickly collapse because they are not generating real revenues. Pokecoin is a company registered in the UK, but only for tax purposes. So, it is just an empty box with a name that was created just one month ago. The Pokecoin company is not registered with the FCA, therefore it is not authorized to provide the investment services it is offering. PokeCoin is a Ponzi scam that will absorb a lot of money, stay away from it! If you want to see what kind of profits are realistic in trading, try a free demo with a regulated broker. On the demo you can learn to trade profitably and see what it takes to make real money.